Starring: Chris Hemsworth, Jessica Chastain, Emily Blunt, Charlize Theron, Nick Frost, Rob Brydon, Sheridan Smith, Alexandra Roach. Rated: PG-13 for fantasy action violence and some sensuality. If you saw 2012’s “Snow White and the Huntsman,” it should be pretty easy for you to decide whether to see the new film “The Huntsman: Winter’s War.” It’s not really a seqel, it tells a parallel story with some of the same characters. As with the first movie, there’s a lot to like and a lot to dislike – and they’re pretty much all the same things as in the first film. If you didn’t see the first film, there’s not a whole lot to enjoy about this one except the visuals, which are admittedly pretty stunning. “The Huntsman: Winter’s War” is separated into two stories. The first centers on Freya (Emily Blunt), sister of Ravenna (Charlize Theron) – the evil queen from the first film. Freya has her heart broken and becomes a powerful ice witch – and when she takes a kingdom to be a queen in her own right, she declares love a sin, punishable by death. 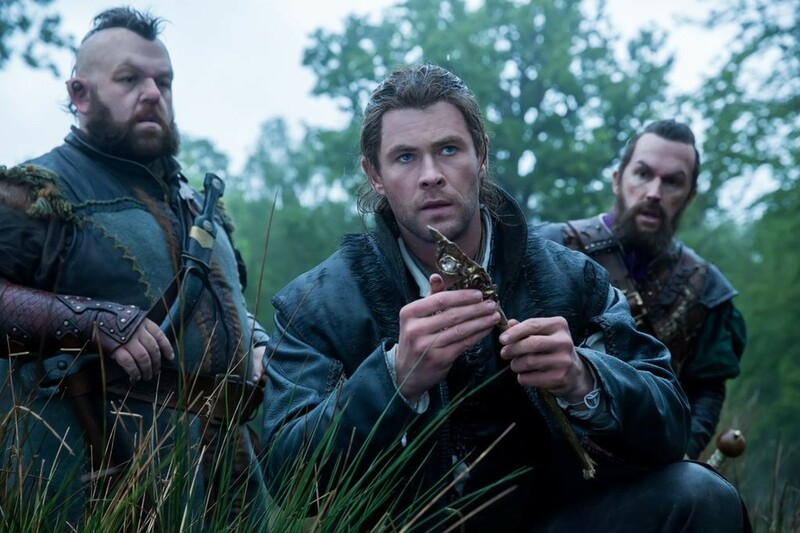 Eric (Chris Hemsworth), the titular huntsman in both films, is taken as a child and raised along with her other thoroughly-trained soldiers. Also taken is Sara (Jessica Chastain), and it’s clear from the beginning that they’re going to fall in love and Freya will not take it well. Once thats sorted out, a voiceover jumps us forward to after the first film, and into a new story. The main action here is all about Ravenna’s mirror, which has been stolen and is sought by pretty much everybody. Eric is recruited to find it, and sets out accompanied by two of the dwarves from the first film. This is where one of the things to dislike from the first film raises its ugly head: once again, average-sized actors have been cast as the dwarves, and resized with a blend of CGI and actual little people used as body doubles. Why not cast any of the numerous little actors in the world? Peter Dinklage is already famous for doing this kind of gritty fantasy, and there’s also Warwick Davis, Danny Woodburn, Debbie Lee Carrington, Kiruna Stamell, and plenty more. There are only four main dwarf characters, this should have been a pretty straightforward casting situation. This is like casting white people to play people of color and using CGI or makeup to change their appearance – which happens all too often as it is. “The Huntsman: Winter’s War” does have top-notch visual effects – which makes sense, given that its director was the visual effects director for “Snow White and the Huntsman.” Loving attention has clearly been paid to every visual detail, from the sheen on the dark skin of the goblins our heroes encounter to the stunning dresses the queens wear. Unfortunately, the same attention has not been paid to the writing, which is less charming than the first film. Theron gets to do some scenery chewing and is fun to watch, but that’s more down to her own abilities than the material she was given. If you loved “Snow White and the Huntsman” and want to know more about Eric, “The Huntsman: Winter’s War” is worth seeing. Otherwise you’re probably better off waiting for it to hit a second-run house or DVD/streaming.